www.prekandksharing.blogspot.com PreKandKSharing: Make a MUSIC WALL! 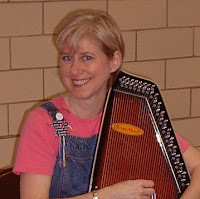 Miss Carole of Macaroni Soup here – and I’m all about participatory music. This idea is about as Jump-Right-In as it gets! 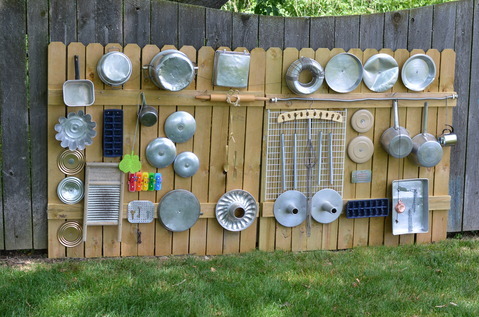 “Ms Sue” Nierman, a friend and collaborator from the Children’s Music Network brought the MUSIC WALL idea to my attention – and I can’t wait to get building at one of the schools where I teach! Just look at this picture – don’t YOU want to play here? I DO! The idea is to find household items, percussive instruments (or pieces of former instruments), or anything that would make a pleasing or interesting sound when rubbed, struck or plucked, attach it to a “wall”, and let the kids have at it! What’s your space? What do you use? How do you attach the stuff? There are no “rules” – got a backyard fence you don’t mind putting some nails, cup hooks, screws into? If not, what about scavengering for a piece of fence that’s been used, or a new section of fence at a garden or hardware store's end-of-summer sale? An 8’ strip of lattice or trellis? Be creative – do it inexpensively! Check out Filth Wizardry: Music Wall to see another Music Wall - this one by Lindsey and her 3 little girls. There's some great up-close pictures of how things are attached - and her original inspiration - The Music Tree! I suggest not trying to teach your child(ren) how to use it. Let your MUSIC WALL be a place of discovery. For a Family Music Wall at your home, get everyone involved. Check your garage, kitchen, basement – wonderfully musical things lurk there! I plan to put an old bicycle wheel (ok, so my husband doesn’t know he’s donating it yet, but he must have one to spare!) on a large nail. I envision it being spun while the kids take a small metal spatula to the spokes to make them sing! I also have a xylophone with a few bars missing – but the remaining bars make beautiful tones! It’s going on my wall. A MUSIC WALL can be a constantly evolving creation. It can be big or small. It can be permanent or seasonal. It doesn’t even have to be a wall! How about an old ladder – just attach things on the rungs so that it can’t be climbed from either side – safety first! If you make one – send me a picture. I’d love to see MUSIC WALLS all over the world – yeah, I think big! What could you sing with a MUSIC WALL? How about “I Am A Fine Musician!” It’s on my “Sticky Bubble Gum” cd. If you need a melody refresher, or hear it here. It's the JULY Song of the Month on my Macaroni Soup website. I play on the Wall, I play on the Wall, I play the on Wall all day! I play on the Wall, I play on the Wall, I play on the Wall all day! For more information about The Children’s Music Network, check out the website or email me. That’s where I first found out about a MUSIC WALL!- on CMN's email list. We’re a network of people involved with children, music, and networking – and our International Conference is just outside Chicago October 12 – 14. Early Bird rates are in effect until August 10. I guarantee an experience that will enrich, enliven and excite! Yours for a bing-bang-boom Song! MacaroniSoup! Active Music for Kids! amazing idea! it looks so cool too! I wonder what they retirement folks next to our preschool playground would think? lol I bet the sound is incredible :-) fun fun...thanks for sharing! Thanks for commenting. The MUSIC WALL I experienced wasn't much noisier than normal playground noises - and you would have control of the loudness by what you attach to your wall. Heck, invite the retired folks over to make music, too! Please send a picture if you make a MUSIC WALL - I'd love to see it. And thanks for passing it on! That looks like a lot of fun. I remember some of my most fun days in school were playing classroom drums. Taking that fun outside sounds even better. One of the schools I work with is just starting to plan their music wall. The theme for the school this year is developing and implementing strategies for ecologically and environmentally conscious behaviors. They've chosen to make a Music Wall to be a visable and audible manifestation of the theme! How EXCITING! What a great idea, our Kindy is doing one, the children will love it. Thanks for sharing something very special. I am a big fan of your blog.i am so excited by read of your blog's content.really great post.Thanks for sharing superb informations. Your web-site is very cool. I am impressed by the details that you have on this blog.